​Three things you shouldn’t trust are George Brandis, Travis Cloke’s goal kicking and Hobart’s weather, especially in the Spring. So it wasn’t a complete surprise that despite being mid-November, the forecast for Sunday was as gloomy as some of the more pessimistic predictions of what we can expect from a Trump Presidency. The rainclouds looked almost low enough to touch, as I scampered through the drizzle to get in the car. Staying dry was never going to be a long term plan, but I thought I would put off the inevitable soaking as long as I could. 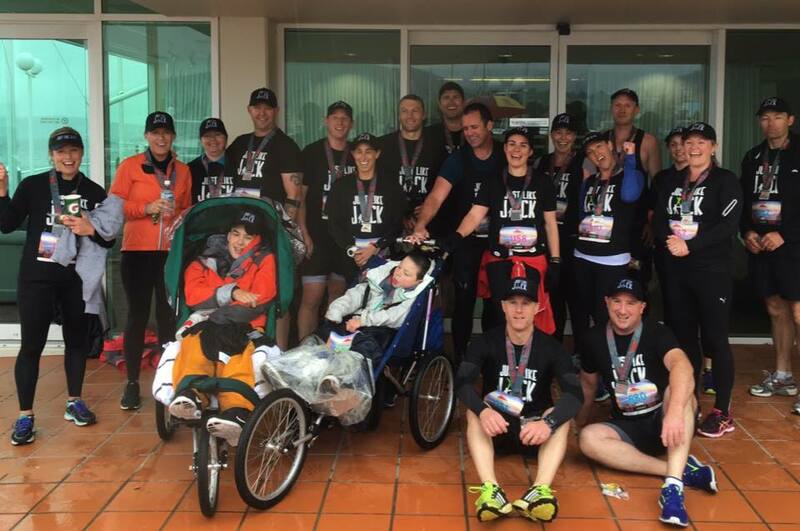 Now I’m very much a fair weather runner (I’m nearly as afraid of water as Malcolm Roberts is afraid of science), but I had been invited to join the Just like Jack team and I certainly wouldn’t let them down because of a little thing like some rain. Jack Duffy is a pretty remarkable kid. At the age of 10 he has- with his dad, Chris- already completed the Overland Track and kayaked around Tasmania. Oh yeah, and he has cerebral palsy. 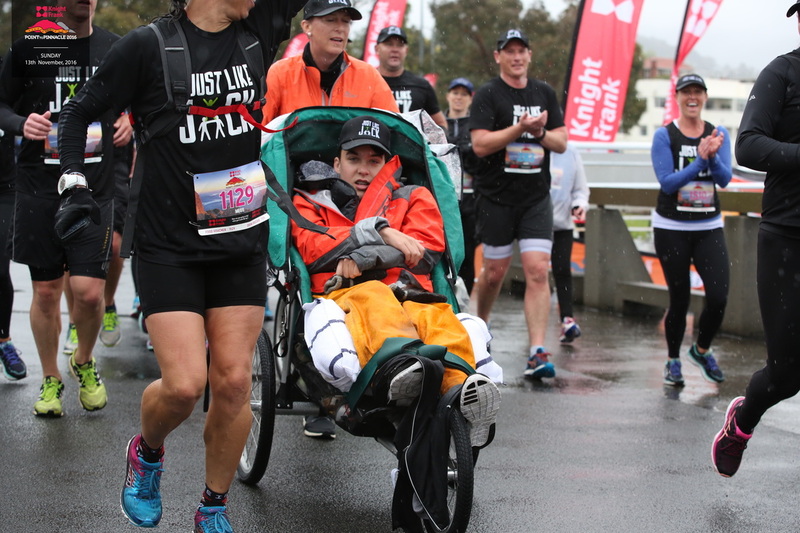 The Just Like Jack team is committed to the idea that with the right support, people with disabilities can achieve the same things as their ‘able-bodied’ counterparts- as Jack is proving- and that all people can achieve amazing things with help and encouragement. 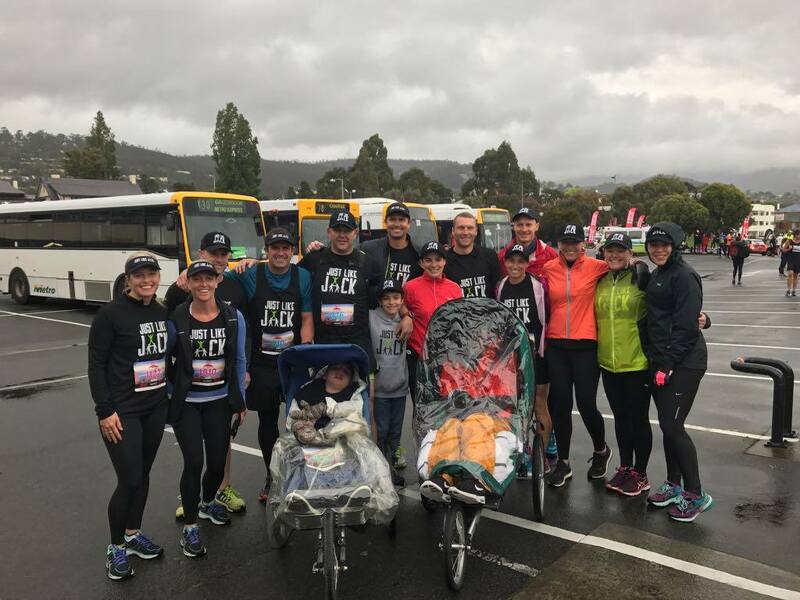 ​​The next challenge on Jack’s list was the 2016 Point to Pinnacle and this time he was joined by 13 year-old Will- who is another little legend with cerebral palsy- and a big team of runners who were keen to join Jack and Will on their trip up the mountain. There was plenty of energy at the start line. Will and Jack were in good spirits and the team posed for a final photo moments before the start of the race. 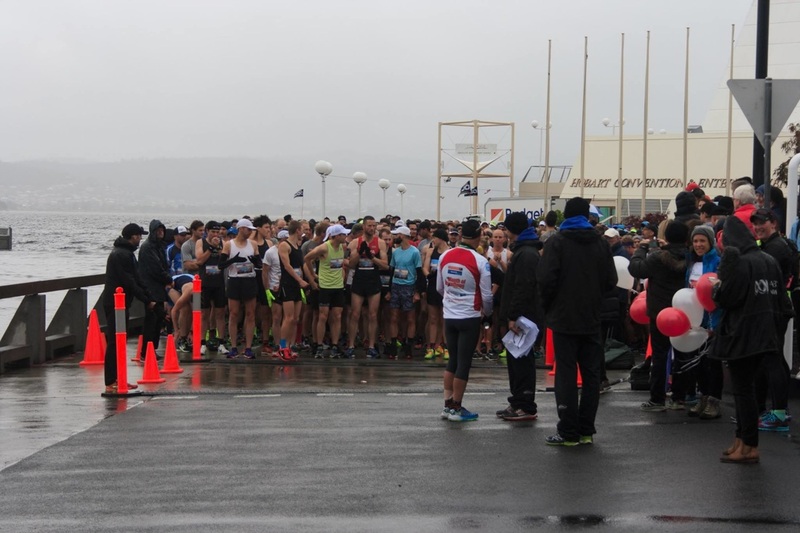 Fittingly, Kirsty took first go pushing Will and we joined the throng of people surging out onto Sandy Bay Road. It was a tricky start. Wyatt Roy is not the only person to find himself in completely the wrong place this year. A number of people had misjudged their speed and got far too close to the front and then immediately caused obstacles to those behind. 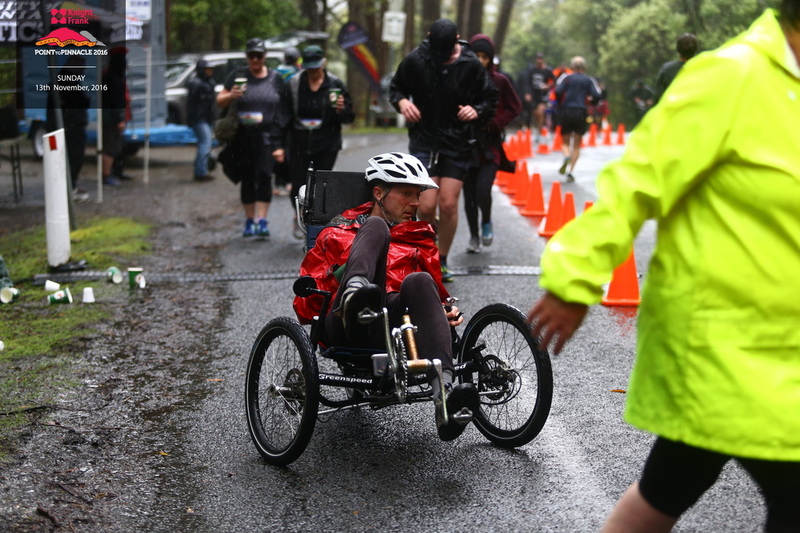 This is hard enough in a normal race (as I found in the Melbourne Marathon), but weaving through traffic pushing a wheelchair takes the difficulty level up a couple of notches. We hit the hill of Byron Street and drove into it hard. It doesn’t get any more bearable the longer you are on it- kind of like Channel 9- so we didn’t slow down to try to make it easier, but pushed on hard and were soon turning into the flatter part of Davey Street. The roads were covered with water, but the rain was still lighter than I had expected as we cruised along Davey Street. Seeing the difficulty we were having going around people, Megs went a few metres ahead to warn people we were coming and clear a bit of a path. Despite being intimidated by Megs’ calves, Gibbo went forward to help out and our path became a bit smoother and easier. As we crossed the Southern Outlet, the gradient began to gradually increase again. This would have been a good time to chivalrously step aside and let the ladies have a go pushing- but since the girls had already taken over and were still going strong it was a moot point so I just coasted along enjoying the conversation. The top of Davey Street is surprisingly steep, as it takes a sharp right hand bend towards the Skyline Service Station. As we neared the first drinks station, I realised that our turbo charged push up the hill and constant rotation of fresh runners had taken Will a bit ahead of the rest of the team. Seeing there was plenty of pushing power to keep Will moving, I took the chance to drop back and see how the rest of the team were going. 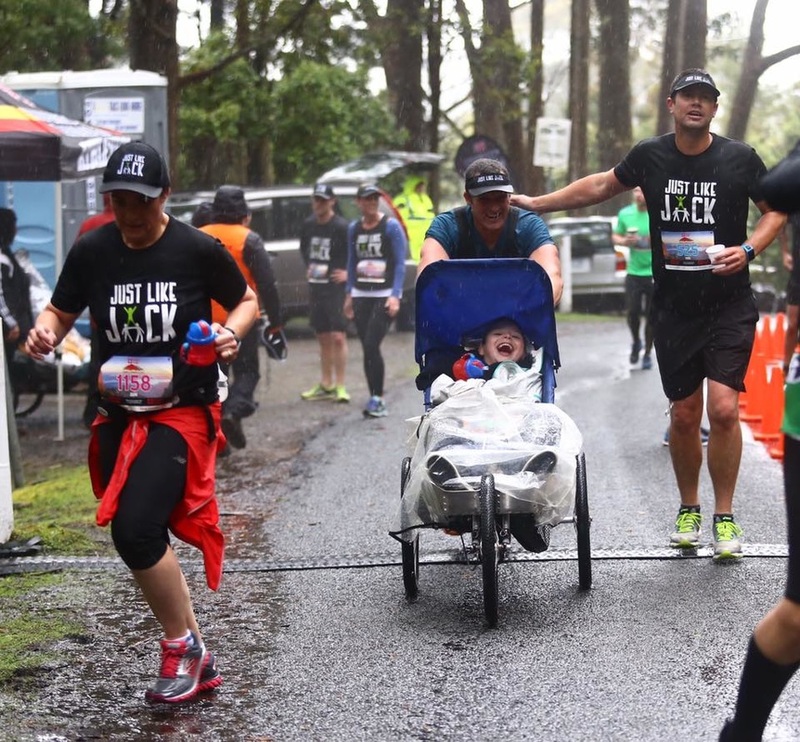 Chris was determined to push Jack all the way himself so he was going slightly slower than the team pushing Will, but he wasn’t far back, with Erin and Morri running in support. Dropping another couple of hundred metres, I came to Kirsty and Rachel who were settling into their own rhythm and running well. I had thought it would be pretty easy to put on a burst of speed and get back up to Will to take my turn pushing again, but much like Tony Abbott, my opinion of my capabilities appears to be somewhat exaggerated. I hadn’t realised how much of a gap had formed and it took a good couple of minutes hard work to catch up again. As the road continued to wind its way up, with the picturesque valley of South Hobart dropping away on our right, we caught up to the amazing Peter Wheatley who was running the 31st and final marathon as part of his Month of Marathons to raise money for clean water projects in third world communities. This was probably the loudest section of the course with both Peter and Will’s support teams making a fair bit of noise, before an increase to the gradient forced us to slow and Peter to run off ahead. The trees began to grow thicker on either side of the road as we climbed higher. We also began to see the first of runners and walkers on their way back on this stretch, including one dude who looked like a shorter, more ginger version of Max Gawn (this was more interesting than it sounds). It had been over half an hour since I had eaten anything, which is as rare as Bill Shorten going a day without issuing a press statement, so it had to be time to break out a bag of lollies and offer them around. I chomped away happily, but no one else seemed that interested, except for Will who was a champ and shared some with me. I dropped back to see if anyone else from the team could be tempted. Jack’s group were still trotting along happily, but no one needed any lollies (this was getting weird), but Jack gave me a cheery roar. Some way further back, Rachel, Kirsty and Lauren proved more receptive (they obviously had forgotten the rule about not accepting lollies from strange men- because I definitely qualify as strange). We had a bit of a chat as we ran for a while, before it was time for me to head back to Will and do some pushing. 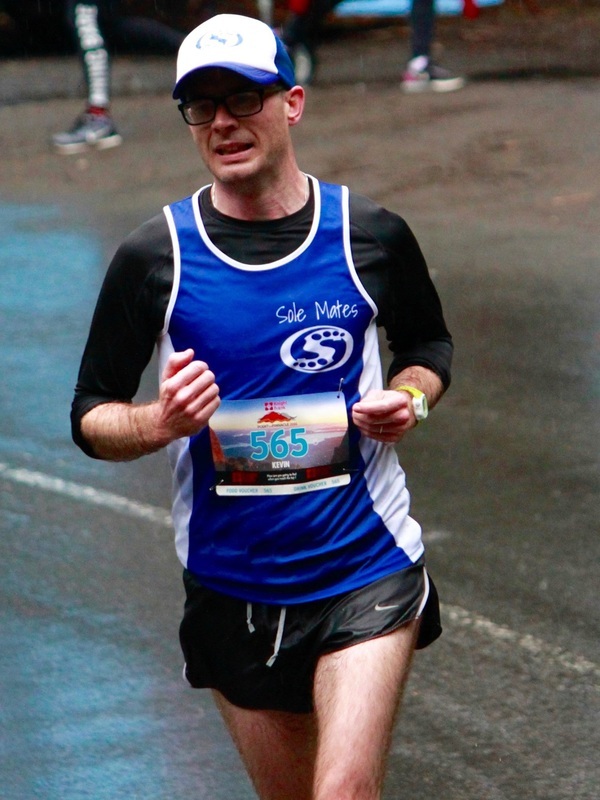 By the time I had caught up, we were really flying towards Pinnacle Road and already well past Strickland Avenue, where a group of flamboyant supporters were bearing large black sandwich boards with quite amusing running puns (well I thought they were funny). The air temperature felt like it had dropped into single figures (I had no way of measuring this so treat my claims with the same caution you do for anything Scott Morrison says- actually no, even my wild guesses are more likely to be true than his statements) and the rain was getting heavier. Rachel had given me her jacket to store on the back of the chair, which I duly did and then forgot about it so I hope she got it back after the run (oops). The press of runners had thinned, but so too had the available space so we had to continue to make heavy use of frontrunners clearing a path. Most people were very gracious, but occasionally we got someone who seemed quite indignant about being warned that a heavy wheelchair was coming up behind them. ​But this type of behaviour was by far the exception. As more and more runners began passing us on their way down, we were the beneficiaries of a steady stream of encouragement. 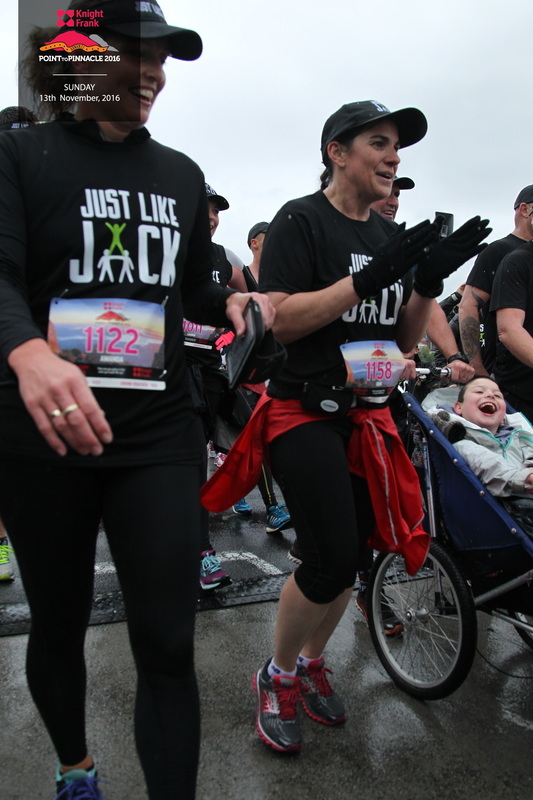 “Go team Jack,” a lot of people yelled and it was great to see how much recognition the Just Like Jack team had. 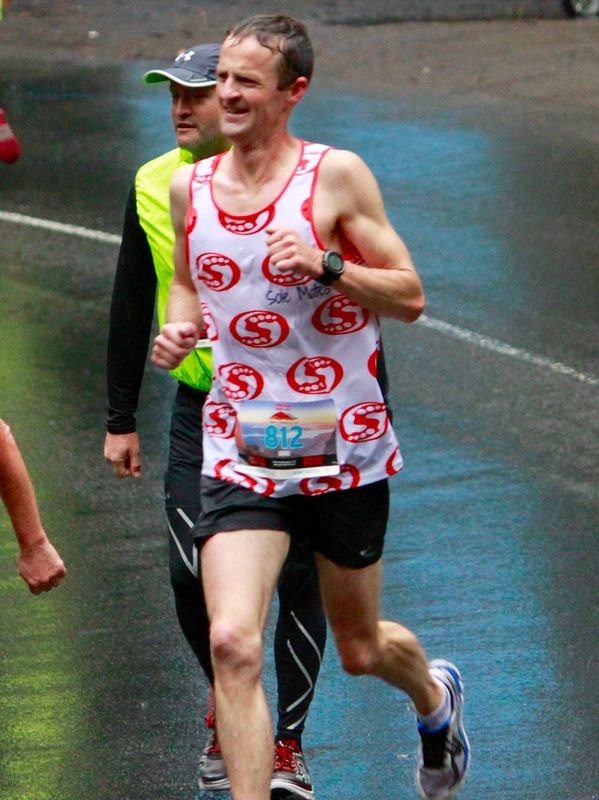 The great thing about running in your home town is you see tons of people you know and today was no exception. A heap of my friends passed going the other way, and I am pretty sure I saw the inspirational Paul Pritchard, which seemed appropriate since he sums up everything Just Like Jack is about. We hit the sharp turn into Pinnacle Road cautiously in the wet conditions, before driving hard to push through the final climb to the turnaround point. Yes that’s right. Due to the appalling weather on the mountain and the condition of the roads, the race had had to be changed to an out and back course. Despite the disappointment of not getting to the top of the mountain, this was 100% the right decision. With low visibility, high rain and strong winds, the likelihood of hypothermia or other first aid emergencies would have been unacceptably high, while coming back down roads by bus would have been more dangerous than moving to Summer Bay (seriously, per capita that place has to be the crime capital of the world). Having decided that we were a bit too spread out, we chose to wait at the turnaround until we had everyone back together. It is always nice to see all your friends again (thought O.J. Simpson when he saw the jury box for his trial) and everyone got a bit of a boost (not the Essendon Football Club version either) before we set off back down the hill. The second half of the race was easier for those pushing Jack and Will, with the chairs pretty much pulling them along (well that’s how I am calling it- after a couple of pushing cameos on the way up, I have to admit most of work was done by others today). We stayed pretty close together for the first few kilometres on the way back, but after the Strickland Avenue turnoff we began to spread out again. There were a number of hardy volunteers and supporters standing out in the very cold weather. I have to say clearly just what an amazing contribution all of these people make, both to the running of the event. Not only do they provide the drinks, but also the atmosphere by providing plenty of encouragement and enthusiasm. As we came further down Huon Road, the rain clouds seemed to lift a little and we could see the city unfolding way below us. Despite slightly sore hips and quads from the unusual experience of running continuously downhill, this was quite a pleasant stretch of the run. The team began to group up again as we approached the Southern Outlet, with runners bouncing up and back between the groups to make sure no one was left behind. Soon after we hit back Sandy Bay Road, we had the whole group running together again. It was a nice final stretch, unless you were in one of the cars we were passing on the other side of the road, which were moving as slowly as Australian Government attempts to reduce carbon emissions. The canopies on both wheelchairs were down for the last stretch. Jack was laughing and Will was grinning. Once again, Kirsty was pushing Will, while Chris as he had for the last two hours, was pushing his son. The track had become crowded with walkers again, but we had plenty of front runners to clear a path for us. Turning into the final straight below the casino, we got an almighty roar from the crowd as we headed for the finish, line where we were met by members of the army reserve to present us with our medals. We finished in about two and a half hours but the time wasn’t really what we did it for (full results for all runners can be found here). It was an awesome experience to be part of. Jack and Will were troopers in the tough conditions and all of the Just Like Jack team were positive and enjoying the day. 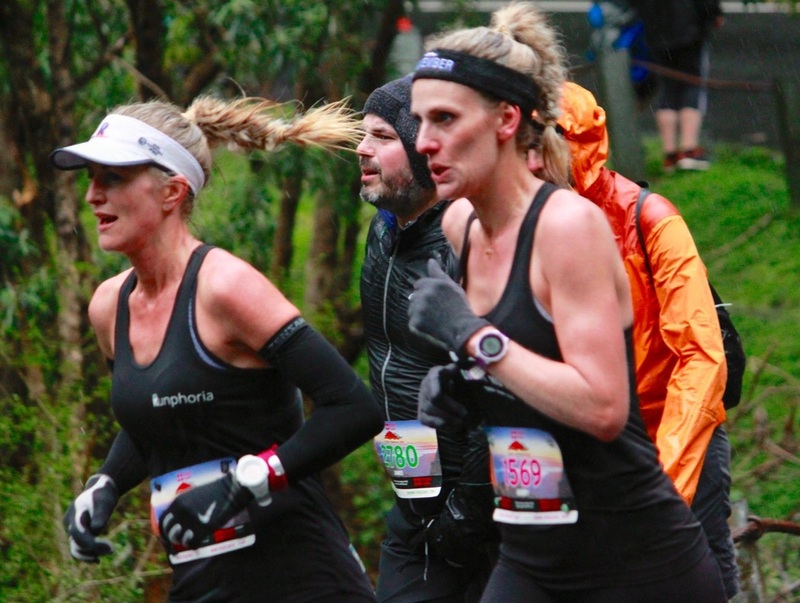 The support and encouragement we got from spectators, fellow runners and walkers was exceptional. We may not have got to the summit this year, but that just means we get to do it again in 2017. Looking forward to it already.